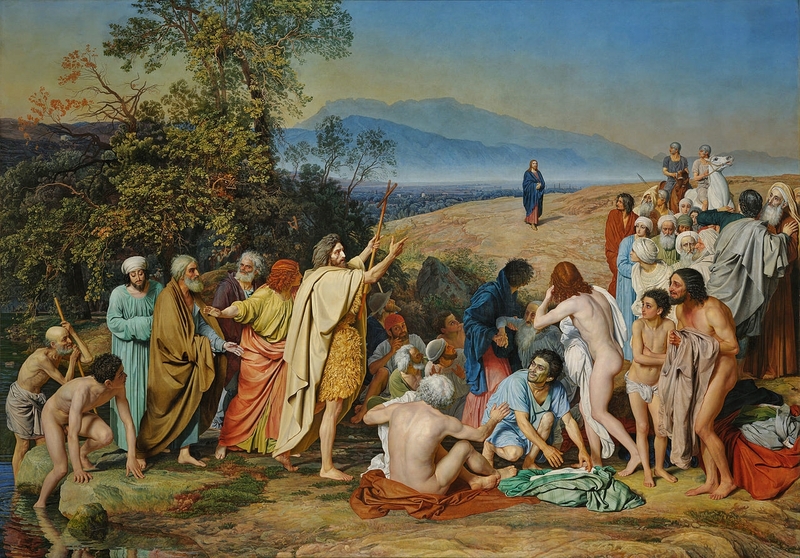 It is striking that for all that was prophesied, the very reality of God becoming man takes place in silence, as though the full symphony of the prophesies, the long history of exiles and returns to promised lands, the lavish canticle of canticles and the ceaseless litany of mercies that has been sung from Eden to Nazareth has been paused. The Word fills the solitude of the ages. The Word dwells among men. Silence and solitude go in tandem. Silence is proper to solitude, to the experience and reality of being alone. It is a paradox then, that the existential solitude inherent to the human experience is ultimately the meeting point of the soul with God. John the Baptist lived in the solemn silence and solitude of the desert, and in that solemnity, recognized in himself the voice given to announce the arrival of One who had come among men. From the desert silence of John comes the voice that reveals the coming of the Word, in the Flesh. “I am not the Christ, he said, nor Elijah, nor the prophet. And the question came: Who are you, then? He replied: I am the voice of one crying in the wilderness: Prepare the way for the Lord. The voice of one crying in the wilderness is the voice of one breaking the silence. Prepare the way for the Lord, he says, as though he were saying: “I speak out in order to lead him into your hearts, but he does not choose to come where I lead him unless you prepare the way for him”. In the same breath, God hides himself, remains distant, absconded — yet the prophet speaks of him as the Savior: as the one who comes to save. In the hiddenness of silence the advent takes place. Silence then, is not alienation or passivity. It is not the expunging of human will and intent. It is the fully active participation in mystery– the preparation that instructs us. Silence deepens the expectation and the longing. Silence illuminates the hiddenness of God. let all the earth keep silence before him. Silence reveals the way we should present ourselves before this God who comes to save. Here the very language of man in his solitude is learned. It is the language of pure adoration — the language of love; ultimately the language of union. For God is silence, and in silence is he sung by means of that psalmody which is worthy of Him. I am not speaking of the silence of the tongue, for if someone merely keeps his tongue silent, without knowing how to sing in mind and spirit, then he is simply unoccupied and becomes filled with evil thoughts: … There is a silence of the tongue, there is a silence of the whole flesh, there is a silence of the soul, there is the silence of the mind, and there is the silence of the spirit. The silence of the tongue is not simply passive — avoiding speaking — but it is also the active silence of betrayal, for the mouth is left unused to speak the truth. The whole prophetic lineage defies this silence, and prepares for the advent of the one who comes to shatter the darkness. “The people who walked in darkness have seen a great light; upon those who dwelt in the land of gloom a light has shown” (Isaiah 9:1). The silence of the flesh is preparative. In it the passions are ordered to God, and long for him. The flesh awaits it redemption, as it deeply longs for and needs its Redeemer. Chaste and pure it makes of itself an offering — an offering of flesh and blood that is itself purified by the One who becomes flesh to save it. Human loves are transformed; fleshly desires are exalted and ascend to the beatitude they behold. The silence of the soul is the canticle of love. It seeks the object of his love and rests in the hope of the coming union. The silence of the spirit is the silence of the Incarnation. “But unto you that fear my name, the Sun of justice shall arise, and health in his wings: and you shall go forth, and shall leap like calves of the herd” (Malachi 4.2). The night is transformed by the Dayspring. No longer does the darkness reign, but in its tranquil stillness the Voice is heard, the Voice who is heard because he cries out, announcing the coming of the Word that is understood and beloved. It is precisely in this tranquility, in this exalted silence, that we meet Mary of Nazareth. The penitence of John, awaiting the Lord in the desert mirrors the silence of the Virgin, a maiden in the small town of Nazareth who receives the visit of the Angel in the silence of her hidden life. The Virgin of Nazareth exemplifies the solitude of the ages — the long-awaited advent of the Redeemer — as she becomes the temple of the living God. As the infinity of God meets the finiteness of human flesh in the Incarnation, one woman first truly beholds His glory. Her soul, resting in the solemn silence of the mystery, revels and must prophesy. She becomes the first preacher of the coming of God in the flesh. She magnifies the Lord, who has looked upon her lowly flesh, and has exalted her. She beholds Him, in silence and in her flesh. She becomes the new temple, the living temple for the Holy of Holies. Chosen among women, living in the world, she transcends the world as she bears the Word made flesh, meditating in her heart the significance of a new communion between God and man. Hail, O hidden Sense of the Ineffable Plan! Hail, O Belief in Silence That Must Be! Hail, O Forecast of the Marvels of Christ! Hail, O Fountainhead of truths concerning Him! Hail, Celestial Ladder, by whom God came down! Hail, O Bridge leading earthly ones to heaven! Silence prepares the way. Silence is the forecast of marvels, the parted veil of faith, the ladder of ascension, the spring of truths untold, the bridge of union. Silence prepares the flesh to love the Word made flesh. It sets human loves aright and satisfies the deep longings of the human heart. Silence prepares the heart. In the absence of the cacophony of sin, the human soul alights and delights in the joys of the blessed. Behold Him, who takes away the sins of the world! …Let all mortal flesh keep silence.